This free letter Aa alphabet play dough mat encourages a multisensory approach to learning the letters. The black and white letter Aa mat includes an area to make the letter with play dough, visual scan for the letter to cover it up and hide the animal behind the play dough. The grayscale color is economical to copy for a group of children. If they choose, they can color the playdough mat first and then laminate it to use over and over again. No lamination available? You can put the playdough right on the paper. 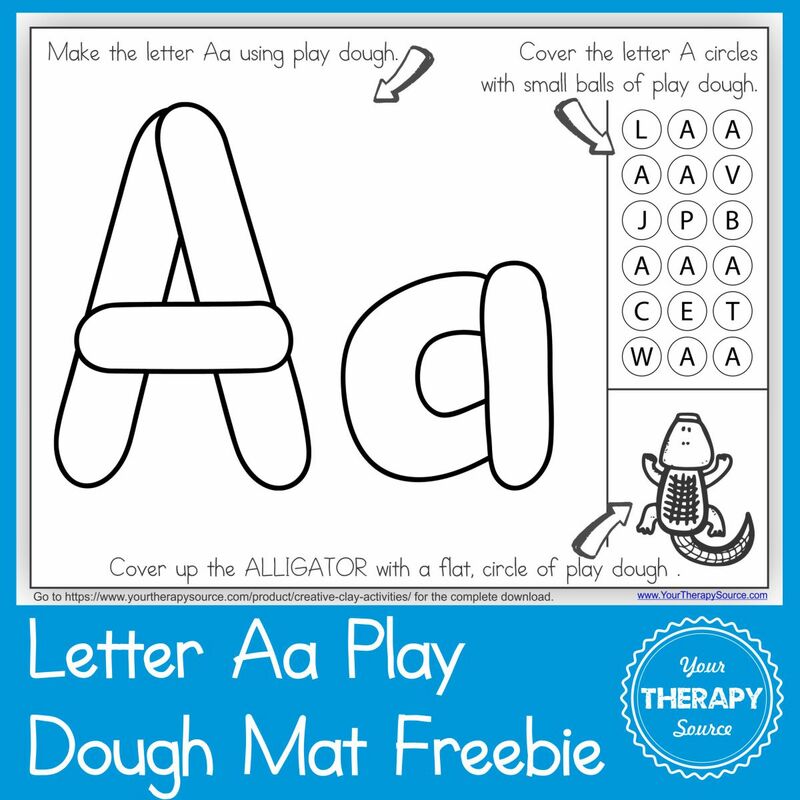 Download your FREE LETTER A PLAYDOUGH MAT. This is from the Creative Clay UPDATED digital download. These activities encourage tactile and proprioceptive input, fine motor skills, muscle strengthening of the hand and fingers, visual motor skills, visual perceptual skills, math skills and letter formation. 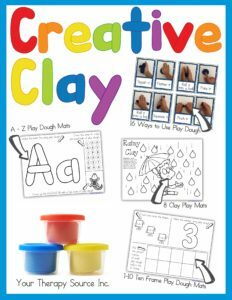 This is a great book for any pediatric occupational therapist – add some new, fun games to your use of clay, make copies to give to teachers or send home activities with your clients. Most of the pages are in black and white for economical printing and children can color the pages if they wish. You will need modeling clay, resistive clay or playdoh to do activities. This does not include any clay only the download of activities. Laminate the play clay mats for durability. 16 ways to use play dough cards – each photo card is 1/2 page or you can print smaller cards 8 to a page. Perfect to laminate and place in a play dough station to encourage various ways to manipulate play dough. The cards are in color but easily print grayscale. 8 play clay mats – black and white mats to encourage finger strengthening, counting and more. 26 alphabet mats – black and white mats for all the letters A to Z. Make the letter, find and cover the letters and cover the animal. Ten frame mats – black and white 1-10 number mats: count and name shapes, make the number and complete the ten frame.